We’re going to compare two of the most popular blenders on the market today to help you determine which is best for you: the Ninja Blender and the Nutribullet. The word “ninja” brings to mind a picture of a person in a black suit who’s about to karate chop something, maybe tear their opponent apart. The Ninja blender works with this very intention. 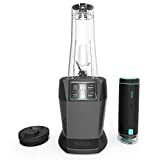 The blender comes with a steady base, a two blade cutting system, two 16-ounce cups, two sip and seal lids, and a guide with 30 recipes. It’s easy to use. Just put your food in the cup, screw it onto the power base, and off you go. The Ninja blade is a two blade system. It has one facing the bottom of the cup, to pull the food from the bottom of the cup upward. The second faces the top of the cup to pull food down into the blades. This helps to ensure sure that your food is chopped up evenly, not mushy on the bottom and still solid at the top. The blades are also thicker than other blades, so it does a good job chopping up your favorite frozen fruits or ice—though you will have to break your frozen items into smaller parts so that your food blends evenly. One of the best features is the cup that it uses. It’s made of plastic so it won’t break if you drop it. It also screws securely into the base so that none of the goodness you’re making will leak out. But, best of all, these cups are dishwasher safe. The lids and blades are too. You just blend, drink, rinse, and throw it all in the dishwasher. There’s no quicker or healthier way to start off your busy day. These cups are also tall and slender. If you are in a particular hurry and need to take your morning smoothie on the run, it will fit perfectly in the cup holders of your car. The downfall with this product is that you only get two cups. What if you have a family of four? With only two cups available, there’s no time for the dishwasher. Someone will have to wash a cup by hand in order to use it. Beware, though, that the Ninja can be loud when it’s in use. Especially when chopping up hard or frozen foods. You can tell by the name that this product will fit into your lifestyle. It gives you good nutritional food quickly. The Nutribullet has a two blade nutrient extractor system that reduces even the hardest of foods into a smooth-as-silk smoothie texture. You don’t have to worry about breaking your hard and frozen foods into smaller pieces for this bad boy. It’s heavy-duty and can handle anything that you put in it. 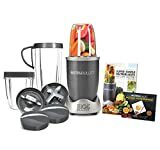 The Nutribullet comes with the power base, your blades, a 32-ounce cup, a 24-ounce cup, a lip ring, a handled lip ring, a pocket nutritionist guide, and a recipe book with a user manual. If you’ve never made a smoothie, try one of the recipes that they give you. Just put your food in your cup, screw the cup onto the base, and blend away. Although the Nutribullet is known best for making shakes and smoothies, it can also be used for other things. You can chop nuts or use it to cut vegetables into smaller pieces. You can use it to make soups (though not hot), or maybe even baby food. The uses for the Nutribullet are endless. Again, the cups that come with it are made of heavy-duty plastic that won’t break if you drop it. You do have to be careful to not break the tabs off, though, as the blender will not work without all the tabs in place. It is recommended that you either pulse the blade rotations or run it for 30 seconds and then give it a brief (one to two second) break. You do not want to run it longer than 60 seconds or it may overheat. Though the Nutribullet is tough enough to shred through the skins of fruits and vegetables, as well as crush frozen foods, you have to be really careful about how much you fill the cups. They do have a tendency to leak a little more than other units. The Ninja Blender is best when used for softer foods. Frozen and other harder objects need to be broken down into smaller pieces in order for you to get the silky texture that you’re looking for in smoothies. The Nutribullet is best for harder and/or frozen foods. Its high power helps the blades break even the biggest objects down to the liquefied state that you desire. Though all blenders can leak when overfilled, however, the Nutribullet does have a tendency to leak a little more than other options on the market. Both are good units and easy to use. You just have to decide what you will use it for the most. Soft fresh foods or hard and/or frozen foods? Now that you’ve read our comparison, you can decide which blender is the best option for your situation. Either way, you really can’t go wrong. We also take a look at some of the other Ninja blenders here. Choosing a Juicer: Masticating VS Centrifugal? Juicers vs Blenders: What’s The Big Difference? Vitamix 7500 vs 750: Which One is Best?